…to travel is worth any cost or sacrifice. Don’t tell me how educated you are, tell me how much you travelled. Experience, travel – these are as education in themselves. Traveling outgrows its motives. It soon proves sufficient in itself. You think you are making a trip, but soon it is making you – or unmaking you. One’s destination is never a place, but always a new way of seeing things. If you’re… physically fit, hungry to learn and be better, I urge you to travel – as far and as widely as possible. Sleep on floors if you have to. Find out how other people live and eat and cook. Learn from them – wherever you go. Two roads diverged in a wood, and I— I took the one less traveled by, and that has made all the difference. NOT I – NOT ANYONE else, can travel that road for you, You must travel it for yourself. A wise man travels to discover himself. The saddest journey in the world is the one that follows a precise itinerary. Then you’re not a traveler. You’re a f@$%ing tourist. For the born traveller, travelling is a besetting vice. Like other vices, it is imperious, demanding its victim’s time, money, energy and the sacrifice of comfort. At its best, travel should challenge our preconceptions and most cherished views, cause us to rethink our assumptions, shake us a bit, make us broader minded and more understanding. I finally felt myself lifted definitively away on the winds of adventure toward worlds I envisaged would be stranger than they were, into situations I imagined would be much more normal than they turned out to be. How you live your life is up to you. You have to go out and grab the world by the horns. Rope it before it ties you down and decides for you. Do we really want to travel in hermetically sealed popemobiles through the rural provinces of France, Mexico and the Far East, eating only in Hard Rock Cafes and McDonalds? Or do we want to eat without fear, tearing into the local stew, the humble taqueria’s mystery meat, the sincerely offered gift of a lightly grilled fish head? I know what I want. I want it all. I want to try everything once. Travel, in the younger sort, is a part of education; in the elder, a part of the experience. Tourists don’t know where they’ve been, travellers don’t know where they’re going. Adventure is a path. Real adventure – self-determined, self-motivated, often risky – forces you to have firsthand encounters with the world. The world the way it is, not the way you imagine it. Your body will collide with the earth and you will bear witness. In this way you will be compelled to grapple with the limitless kindness and bottomless cruelty of humankind – and perhaps realize that you yourself are capable of both. This will change you. Nothing will ever again be black-and-white. It’s a funny thing coming home. Nothing changes. Everything looks the same, feels the same, even smells the same. You realize what’s changed is you. I can’t think of anything that excites a greater sense of childlike wonder than to be in a country where you are ignorant of almost everything. A great way to learn about your country is to leave it. There is no unhappiness like the misery of sighting land (and work) again after a cheerful, careless voyage. Travel isn’t always pretty. It isn’t always comfortable. Sometimes it hurts, it even breaks your heart. But that’s okay. The journey changes you- it should change you. Make voyages! Attempt them… there’s nothing else. Nothing can be compared to the new life that the discovery of another country provides for a thoughtful person. Although I am still the same I believe to have changed to the bones. Travel is the great leveler, the great teacher, bitter as medicine, crueler than mirror-glass. A long stretch of road will teach you more about yourself than a hundred years of quiet. Traveling around the world, sometimes we forget how many incredible places the United States has. 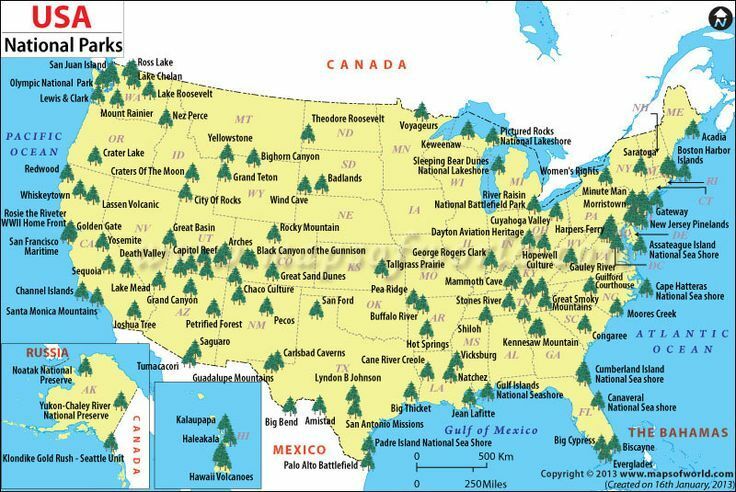 The National Parks, Monuments, Forests, and even State Parks and Monuments. We want to explore more points of interest that make the USA what it is. We are starting a National Sight Series and will begin seeing more of what the USA has to offer.